This Kilogram Has A Weight-Loss Problem Locked away in a Parisian vault, an old cylinder of metal establishes exactly what a kilogram weighs. Unfortunately, the mass of that cylinder appears to be changing. Now, a group of physicists wants to clear up the problem by redefining the kilogram, with the help of a very sensitive scale. More than a century ago, a small metal cylinder was forged in London and sent to a leafy suburb of Paris. The cylinder was about the size of a salt shaker and made of an alloy of platinum and iridium, an advanced material at the time. The international prototype of the kilogram is inside three nested bell jars at the Bureau International des Poids et Mesures in Paris. In Paris, scientists polished and weighed it carefully, until they determined that it was exactly one kilogram, around 2.2 pounds. Then, by international treaty, they declared it to be the international standard. Since 1889, the year the Eiffel Tower opened, that cylinder has been the standard against which every other kilogram on the planet has been judged. But that's creating problems. According to scientists, the cylinder's mass appears to be changing. The solution is a new kilogram, one that is based on a constant number instead of a physical object. To get that number, scientists have had to build a special kind of scale, one that measures the kilogram without balancing it against another mass. It has been a long, slow process, but today they are close to redefining the kilogram once and for all. If somebody sneezed on that kilogram standard, all the weights in the world would be instantly wrong. For that reason, the official kilogram is kept locked inside a secured vault at the International Bureau of Weights and Measures near Paris. Scientists are so paranoid that they've only taken it out on three occasions: in 1889, 1946 and 1989. Each time, they've compared it to a set of copies. 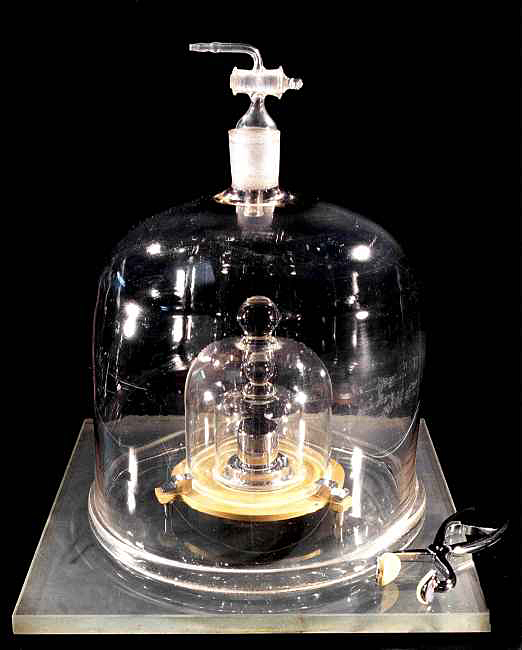 In 1889, the copies and the kilogram weighed the same, but by 1989, they had drifted apart. 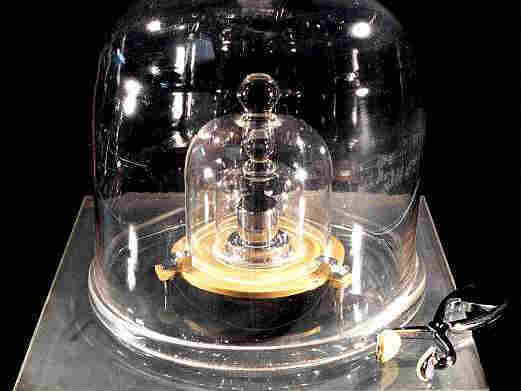 Based on the data, the kilogram appears to weigh slightly less than the copies. The real crux of this problem is that it's impossible to tell what has changed over the past 120 years. The copies may have grown heavier over time by absorbing air molecules. But it's equally possible that the kilogram is getting lighter. Periodic washings, for example, may have removed microscopic quantities of metal from its surface. Or it could be that both the copies and the kilogram are changing, but at different rates. There is no way to tell what's happening because mass is always calibrated against another mass, says Peter Mohr, a theoretical physicist at NIST who is working on the kilogram problem. That's the bad news. The good news is that the change is extremely small, around 50 micrograms (billionths of a kilogram). "The actual ramifications for somebody going to the store will be negligible," Mohr says. But "for scientific work, it makes a difference." For that reason, scientists have embarked on a quixotic quest to redefine the kilogram in terms of a fundamental constant. Constants are used by physicists to describe the natural world. They are both precise and unchanging — the perfect instruments for setting standards. Scientists have already used constants to redefine other units of measurement, like the meter. 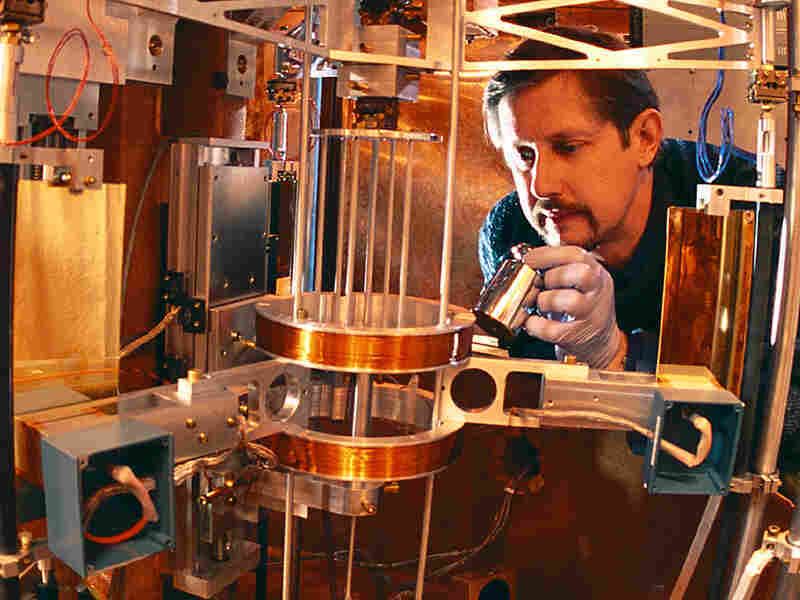 Originally the meter was equal to the length of a piece of metal kept alongside the kilogram, but in 1983 it was redefined as the distance light travels in a vacuum over 1/299,792,458 of a second. Because the speed of light is constant, this new definition means that the meter will never change. 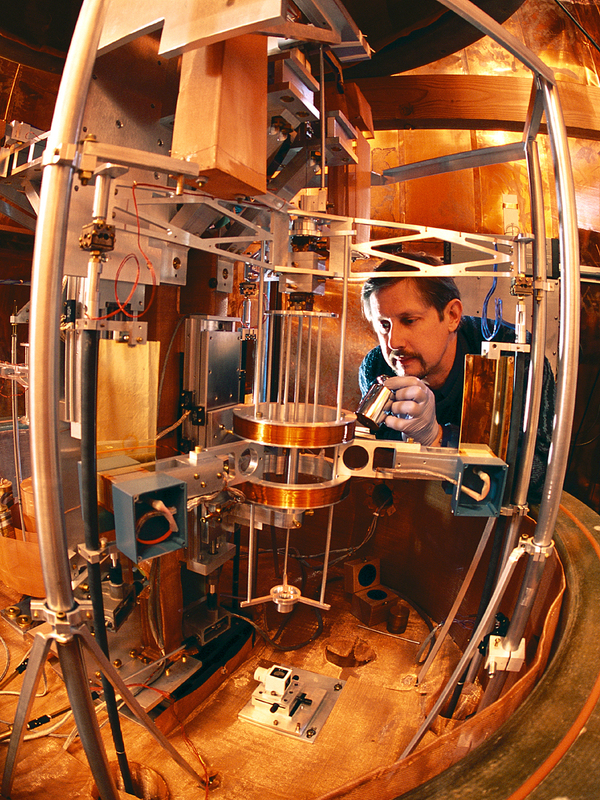 Fixing the kilogram is more complicated. Scientists would like to express it in terms of a fundamental constant called Planck's constant. Planck's constant is a vanishingly small number used in atomic-scale quantum mechanical calculations. Physicist Richard Steiner adjusts the watt balance. This extremely sensitive scale can detect changes as small as ten-billionths of a kilogram. Relating a number that small to something you can hold in your hand, like a kilogram, "is not easy," says Ian Robinson, a physicist at the National Physical Laboratory in the United Kingdom. Some researchers believe the best hope for redefinition comes from a new kind of scale called a watt balance. "It's basically just a very highly calibrated bathroom scale," says Steiner, who is in charge of the watt balance at NIST. Rather than using another mass, watt balances measure the mass of a kilogram in terms of electrical and magnetic forces. Those forces can be translated into a number that is related to Planck's constant. The scale is so sensitive that it can detect changes as small as ten-billionths of a kilogram. "If you pulled a hair out of a person's head and then weighed them, we could tell the difference," Steiner says. Unfortunately, scales that sensitive are sensitive to a lot of other things, too. Lawnmowers, the tides, and even earthquakes on the other side of the world are able to upset the balance. There are many other sources of noise as well. Robinson admits that when he started working on watt balances in the 1970s, he thought it would take just five or six years to redefine the kilogram. Today, after decades of work, scientists believe they are still five or six years away from setting a new standard. Yet most expect that the change will happen. When it does, the metal cylinder in Paris will be replaced by an eight-digit number. Anyone with a watt balance, and a lot of spare time, will be able to measure it for themselves. Mohr says the new kilogram will be worth all the trouble. "People have worried about mass standards for thousands of years," he says. The new, unchanging number would be a significant improvement over the past: "I think it's just the right thing to do."